When you think of Minnesota, the #BoldNorth, particularly in the winter time; you think snow, cold, ice fishing, and snowmobiling. About a year ago, the wheels (or in this case, snowmobile track) started spinning for Levi LaVallee and Polaris, where ideas were being pitched as to how to involve a snowmobile into the Super Bowl. 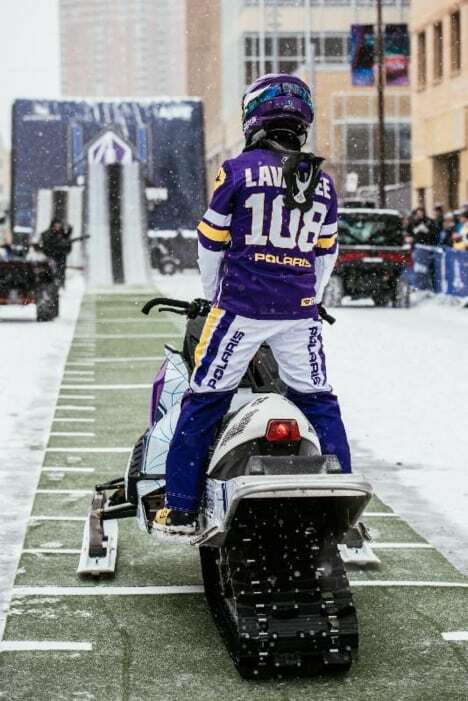 With LaVallee’s “Urban Snowmobiling” (a video edit of him riding around the streets of St Paul, released in February of 2016) being such a huge success, LaVallee and Polaris were wanting to bring that type of bold north spirit to Minneapolis for Super Bowl 52. 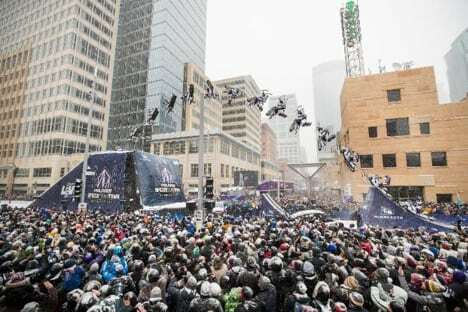 With many concepts and ideas presented, a 100+ foot backflip lining 11th street and Nicollet Mall was the one that stuck. 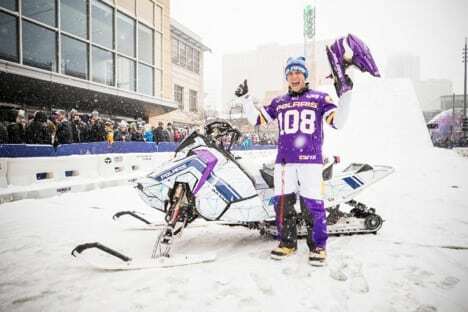 With site evaluations, video edit concepts, city permits, custom MN Vikings themed snowmobile gear, and an off-site replica of the jump were just a few of the many tasks it took to pull off this spectacular event. So how did LaVallee prepare for a jump like this? It all started before the ground froze this past fall and LaVallee started sculpting the landing to replicate the on-site scaffolding landing you saw in the streets of Minneapolis. Once the colder temps dropped, snow was made, and LaVallee started to practice Freestyle (for the Winter X Games) and in between those sessions, he’d practice for his Super Bowl jump … later named Polaris Upside Downtown. LaVallee said he worked in stages; first putting the ramp closer to the landing and moving it back in 10 foot increments so he’d be comfortable with the speed and the distance with the jump, doing straight-air jumps first and then adding in the backflip rotation. For those that don’t know, LaVallee was fresh off of the Winter X Games which were held in Aspen, CO just one week prior to the Super Bowl. 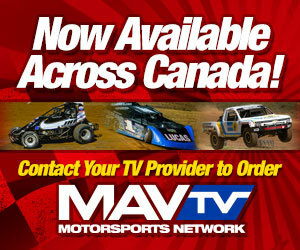 LaVallee took home two silver medals at the X Games, one in Snowmobile Freestyle and one in snowmobile Speed and Style. He arrived home from Aspen, exactly one-week from his Polaris Upside Downtown jump, held at Super Bowl Live. With a mix of weather not permitting him to jump, media opportunities, and only a couple days before scheduled to leave for Minneapolis, LaVallee got to work. He jumped as much as he could at the replica jump-site at his Compound, left the rest of up God, and after four days of practice post-X Games, LaVallee and his crew packed-up and headed down to Minneapolis. Saturday, February 3rd was Polaris Upside Downtown, jump day. LaVallee had a scheduled noon test jump, which caused a big enough stir for fans to come close and not leave their spot until the 1:30PM slot time for the show to begin. 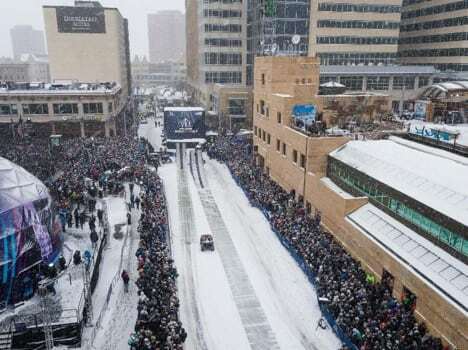 It was a very Minnesota-like day with the snow falling and fans were packing in the streets, enough so much that another street had to be closed off to allow for the overflowing attendance. 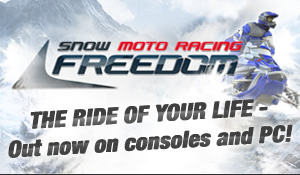 At 1:30PM LaVallee joined MC Chris Hawkey as three Freestyle Demo Riders (Hoyer, Rasmussen and Penner) wowed the crowed with their snowmobile tricks. LaVallee answered to questions, chatted about the Freestyle riders and was quickly back into his rig to get suited up for his big jump. Around 2:00PM LaVallee did one more test jump, buttered the landing and went back for the big backflip to end the Polaris Upside Downtown Show. LaVallee lined his 150+ foot run-in, which mimicked football field turf, launched through the air, flipping his 500+ pound snowmobile and landing perfectly on the other side. With much excitement, LaVallee ran to the top of the landing ramp – put his hands up in the air, pointed to the crowd, and celebrated with the thousands of spectators. LaVallee said that moment on top of the landing was moment to remember.